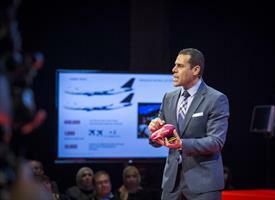 University of Rochester Medical Center urologist Ahmed Ghazi, M.D., has been awarded first place at the Falling Walls Lab Finale in Berlin, Germany. His presentation was selected from among 100 finalists from institutions from across the globe who were given the opportunity to pitch breakthrough ideas in science to a jury of academic and business leaders. Ghazi was awarded for his presentation titled “Breaking the Wall of Surgical Errors” which describes the work of the URMC Department of Urology Simulation Innovation Laboratory and its innovative approach to building patient-specific replicas of anatomy that allow surgeons to practice complex case prior to the actual surgery. During his presentation in Berlin, Ghazi cited the fact that an estimated 1,000 deaths 10,000 serious complications occur every year from preventable medical errors and half of these errors are due to poor performance during complex surgeries. The surgical simulation program harnesses medical imaging, computer modeling, and 3D printing systems to fabricate lifelike organs that to look and feel like the real thing and even bleed when cut. While initially created for medical students and trainees and to help experienced surgeons sharpen their skills, the technology is increasingly being employed by surgeons at URMC to rehearse procedures prior to complex cases, such as partial nephrectomies. The process begins by converting medical images into a computer-assisted design (CAD) by team of biomedical engineers who then convert each CAD of organs into molds, or negatives, which are built using a 3D printer. The molds are injected with a hydrogel which, after freezing, assumes the exact shape of each patient’s organs. By combining 3D printing and injection molding, the team can add a tumor mass, blood vessels, and other components. The precise concentration of the hydrogel for each body component was achieved after rigorous mechanical testing. Entire segments of the body – including artificial muscle tissue, skin and fat, the liver, intestines, spleen, kidney, and other adjacent organs and structures – are assembled and artificial blood vessels are connected to bags of red dye that will “bleed” if cut. The assembled section of the abdomen is then brought to an operating room in URMC’s Strong Memorial Hospital that houses a da Vinci robotic surgical system that is dedicated to the simulation program. Falling Walls Lab is international forum for the next generation of innovators and creative thinkers. The goal of the conference is to promote exceptional ideas and to connect promising scientists and entrepreneurs. Participants gave three minute presentations of their research work, business model, or initiative to a jury made up of experts from academia and business, including a senior advisor for the European Space Agency, a Google executive, the chairman of the board of the Nobel Foundation, and the editor-in-chief of the journal Nature. Participants in the Falling Walls Lab Finale in Berlin are selected from local competitions held at institutions across the globe. Ghazi was one of the winners of the University of Rochester Falling Walls Lab competition held in October. Ghazi took first prize in Berlin and was awarded the "Falling Walls Young Innovator of the Year" title, prize money, a yearlong mentorship on scientific publishing by an executive with the journal Nature, and the opportunity to pitch his idea a second time on the grand stage of the Falling Walls Conference. He will also be invited to serve as a judge for next year’s Finale competition.